Jim Granter » Blog Archive » Hello again. Many moons since I visited this site. thought I’d start back with a picture. Today has been the best of the year so far as the sun is concerned and our friend in the picture took full advantage. 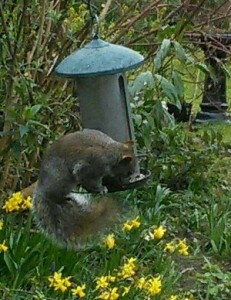 Not that he/she’s been put off such meals by heavy downpours or wind. Anyway, after a visit from two old very human friends who brought a great lunch with them for us all, the day is drawing gently to a close as the sun goes down at the end of the road. Back soon, maybe. Me, and the sun, hopefully.